Typically, the Mailchimp signup form embed code is used as-is. After you build your signup form, you would copy the embed code and paste it into your site. To translate parts of the embedded form code, you'll change the code by hand. This is an advanced feature and is recommended for users familiar with custom coding. Our Support Team won't be able to troubleshoot issues with your custom code, so we recommend that you contact your developer, or hire a Mailchimp Expert if you need assistance. In this article, you'll learn how to translate the signup form embed code. English is the default language for field labels, the subscribe button, and the form's title. Any field labels you translate in the Form Builder, however, will appear in the form embed code. To edit or translate the form title for your embedded form, follow these steps. Under Form Options, update the form title in the field provided. To update field labels and the subscribe button, you'll have to make changes directly to your embed code HTML, and update the code on your website with the modified version. After you've followed to the steps above to access your embedded form, follow these steps. Click anywhere in the Copy/paste onto your site field and highlight all of the form code. Copy the code, and paste it into your preferred plain-text or HTML editor where you can make edits to it. Search or browse your code for this HTML. Follow these steps for every field label you want to translate. When a subscriber successfully signs up via the Condensed form, they are directed to the Signup "thank you" page automatically. This page will appear in the language you set, or the language set in the subscriber's browser settings if you have the Auto-Translate feature turned on. If there are errors on the form, however, subscribers see either the Signup form with alerts or they'll see HTML5 form validation messages. Either way, the subscriber will see the language you've set in the Form Builder or their preferred browser language. The Classic form utilizes a validation plugin to present success and error messages when someone fills out your form. The translations for the success and error messages are generated statically when the embed form is created. These default messages will appear in the Classic form embed code only when your default language is set to a language other than English. The static messages can be translated manually within the form code. Replace any of the text values within quotation marks with your own custom translations. Copy the complete, updated code to your website. Download this file and copy the code. Paste the copied code before the /script tag at the end of the embed code. 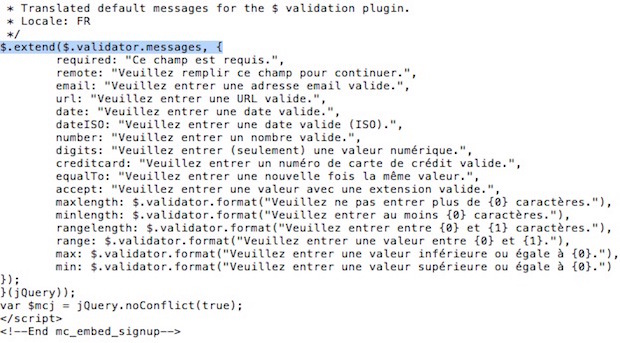 Replace the validation messages within quotation marks with your own custom translations. Just like the Condensed Form, subscribers who fill out your Classic Form may see HTML5 validation messages produced by their web browsers before the form data is passed along to Mailchimp's servers. Click the Signup form drop-down menu, and choose Signup "thank you" page. Click the Translate it tab. Like the Condensed form, the Unstyled form will direct to your hosted Signup Thank You page when the form is submitted successfully. If the form is not submitted successfully, subscribers will be brought to your hosted signup form with alerts or see browser-based validation messages in cases when form information isn't included. Mailchimp lets you translate your signup forms in more than 40 languages. Get a list of our supported languages. And learn how to use our translation tools. We automatically create signup forms for your audience. Learn how to embed a signup form on your site. And find out which third-party sites accept Mailchimp forms. Mailchimp lets you add signup forms on your own site. Learn how to fix common issues for embedded forms.